Who has the right to determine how Richmond changes over time, who can afford to live within the city limits, and how we celebrate and remember our history? Does that power reside in City Hall, or in the office towers of downtown, or behind closed doors in a wood-paneled board room? Does power sometimes move from one person to another or from place to place? How can generations of exclusion be transformed into not just selective engagement but long-term empowerment? Six Points Innovation Center (6PIC) is a gritty workshop nestled in historic Highland Park out of sight of many Richmond residents, where power is percolating, brewing like a science experiment. Young adults are at work every day, reclaiming that “third space” that modern times have almost forgotten, a safe place between school and home where teens work with their hands and minds to shape the world around them. Using power tools, books, arts, and media, young people are expressing their emerging power to shape the urban cityscape. At 6PIC, the building is a unique and malleable work of architecture with a collaborative, organic, evolving structure, which is able to redefne itself to suit the needs of an ever-changing future. There, students experience a new kind of power in having control over their immediate built environment. While a school or community center is often a static structure where students arrive to be engaged, at 6PIC future leaders take managing roles to interpret their surroundings and enhance the building itself through creative problem solving. 6PIC provides teens with a dynamic, progressive learning experience that rivals the offerings of elite programs in larger cities. Here, youth weld, hammer, saw, paint, and monetize their workshop as a practice and as a viable commodity. The former Sunny Days Thrift Shop space owned by Boaz & Ruth was bestowed the moniker 6PIC in design sessions with architect Burt Pinnock of Baskervill Architects and co-founder of Storefront for Community Design, when teens gathered around a conference table to talk about what a youth innovation center would look like. Kids, cautiously picking up a marker like a magic wand, drew a kitchen in first, then lockers, then a community space ringed by amphitheater seating. That was three years ago, and the dream has become real. Visit 6PIC today and there is talk of City Builders, an ambitious program supported by Richmond Memorial Health Foundation where youth learn about the structures of power in the city and address them directly using all the tools and strategies partners offer. 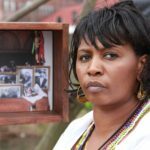 Richmond Association of Black Social Workers’ Daryl Fraser will work with teens to address racial trauma, manifested on Richmond’s landscape in the form of segregated housing, blight, and Urban Renewal. RVA Rapid Transit’s Ross Catrow is the project’s navigator, embarking upon Richmond’s complex historical landscape via the GRTC and providing bus passes to all participants for the year. Storefront for Community Design, Saving Our Youth Virginia, ART180 and Groundwork RVA provide youth with the tools to identify the scars of Richmond’s past in the built environment. Lessons will commence at City Hall’s Observation Deck and descend to the Trail of Enslaved Africans. Later Jo White and the Highland Park Quality of Life Initiative will work with teens to identify places where they will intervene upon the landscape. Predictions include a garden on 1st Ave, park maintenance at Anne Hardy Plaza, and chess tables for the Six Points Intersection. Residents will work with a housing policy analyst to harness the power of policy to address the tide of gentrifcation as it washes north and east in the city, creating uncertainty for residents about the future of Highland Park. And in 6PIC’s rear, the allure of Untold RVA’s bright-yellow social entrepreneurship incubator proves that Richmond’s startup culture isn’t just about gentrifcation but can also become a self-determined pathway to push neighborhood dreams forward. Change is inevitable, certainly, but not every neighborhood seeks to become the next Carytown or Church Hill. 6PIC partners hope that business owners and residents will realize a community vision for commerce in Six Points, Meadowbridge Road, and East Brookland Park Boulevard. 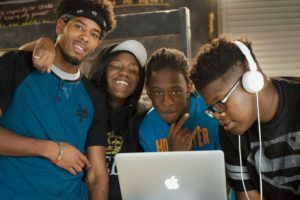 Teen-driven urban innovation, apprenticeship, and trauma-informed counseling have the potential to change the way Richmond non-profits support resident empowerment, neighborhood advocacy, and youth engagement. The strategic co-location of non-profit partners and an in-house social entrepreneurship incubator under one contiguous roof line is living proof that presence is indeed a form of power. 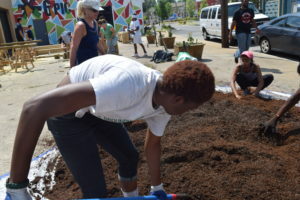 This year, City Builders, youth and neighbors will control project resources and share project oversight, leading the way to a greener, more prosperous future that is informed by a truthful assessment of the past and harnessing the unifying power of their collective work and responsibility. May it be so. Six Points Innovation Center (6PIC), nestled in historic Highland Park, provides a safe place between school and home for teens to work with their hands and minds to shape the world around them. Free is the founder of #untoldrva, a Richmond-based movement that uses technology and design to inspire neighbors, co-workers, family, and friends with the fascinating hidden history of RVA. Winner of the Vegan Iron Chef RVA title, Maat is known for legendary small plates from her VEGI LUV kitchen.